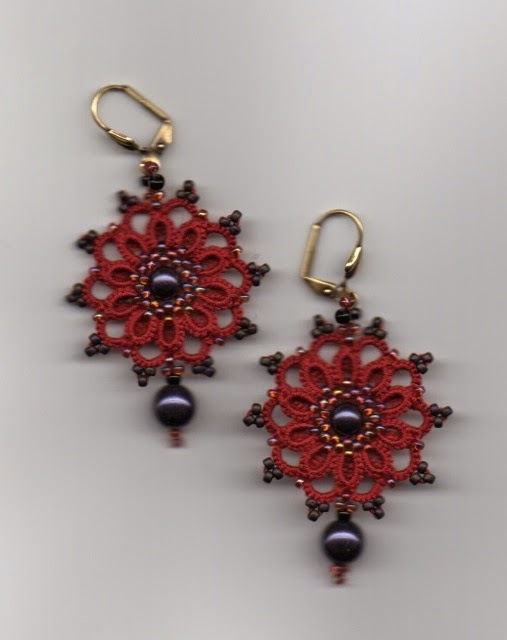 Le Blog de Frivole: A Red Pair… and Springerle! A Red Pair… and Springerle! I had a party to go to last night… yes, I definitely needed a pair of those earrings in red to go with my dress! I like this pattern very much. I attached the dangle and the hanging loop between the rings this time and although my favourite way is probably as in the blue pair, I like them either way. and the red is darker with a tad more blue in it. So difficult to get colours right with photos! 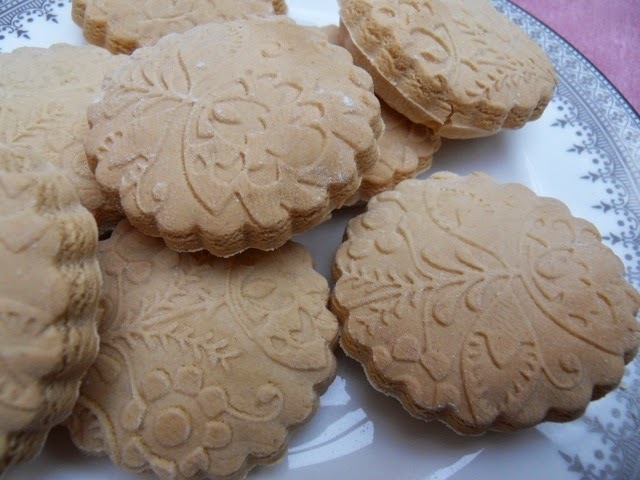 Upon Johanna's recommendation, I had a go at making Springerle biscuits - they are a traditional German recipe that is made mostly at Christmas time from what I understand and which makes use of wooden moulds and rolling pins such as mine. The secret is… you must let the biscuits dry before you bake them. Clever. 12-24 hours. That way the tops go quite dry whilst the bottom of the biscuits stays more moist so that when you bake them, the tops don't move or expand much but the biscuits puff out from the bottom. Look at those perfectly shaped and imprinted little biscuits. The traditional flavouring for those biscuits is aniseed… but I don't really like the taste of black liquorice so I flavoured mine with vanilla. They are not a dry biscuit but have more of a "cakey-chewey" texture. The imprints worked out so well but the biscuits themselves would unfortunately not be on my favourite list for eating pleasure, if I'm honest. So I'm still going to search some more and try other recipes to see if I can achieve the same result (looks wise) with another recipe that I'd enjoy eating more (my husband really likes those though!). Thanks for the suggestion Johanna. I'll give Megan's recipe a try next. That is wonderful to here and I will note that down, I have purchase some very pretty molds and ended up using them to make paper casts because the cookies did not turn out. I found a web sight but had not tried it so glad Johanna suggestion worked out great tip! I make mine with aniseed and we love them! They really don't taste like licorice. I think you might be surprised at the flavor. Ah, thanks for the tip, clever. Prima, daß die Kekse geklappt haben. Ja, der Anis-Geschmach ist für Viele gewöhnungsbedürftig. Die Ohrringe sind wieder sehr hübsch. Ich habe jetzt auch die Technik der Ohrringe probiert und es hat geklappt. Ich habe mir auch die Anleitung gekauft und werde heute noch die ersten Ohrringe probieren. Ich muß nur noch sehen, welche Garnstärke ich verwenden werde. 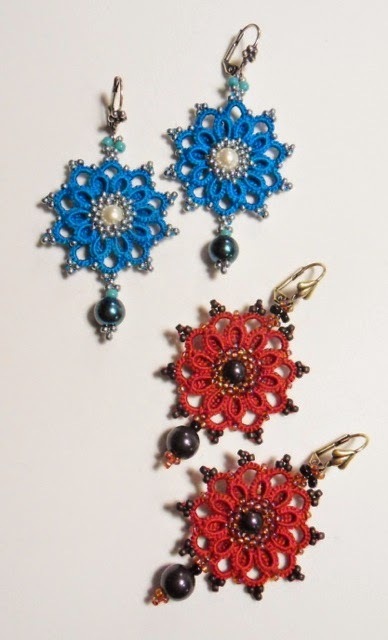 Cute cookies and isn't it cool to make a pair of earrings yourself for that evening! 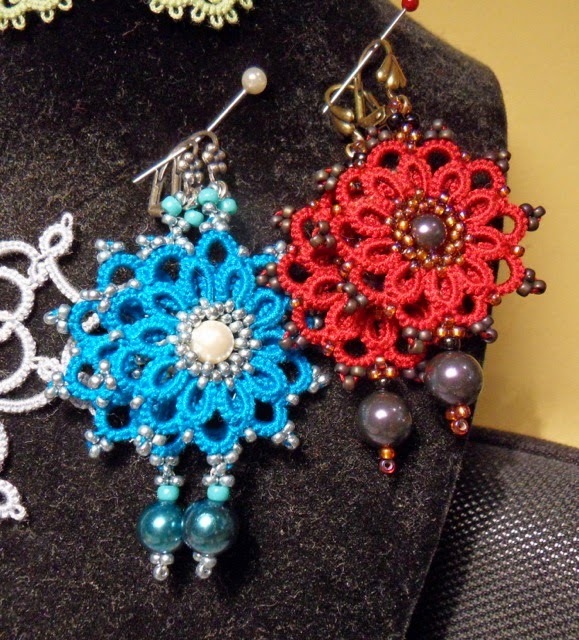 I love both versions of those earrings, they are very elegant. I do hope you find a recipe for cookies you like. The trick with letting them dry before baking might work with other recipes too, who knows? Very lovely earrings... and theses cookies looks delicious!